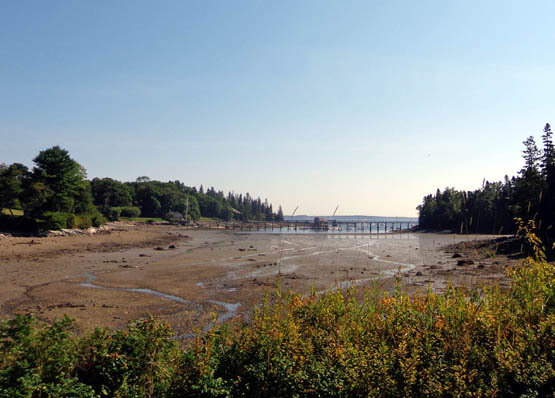 a year yet only has an approximate year-round population of about 10,000." Although we spent most of our time during our week's stay on the island in the national park, we were also curious about the rest of the island. 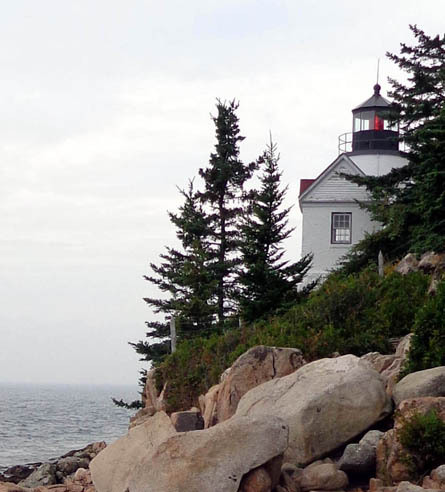 We knew there were several scenic coastal towns like Bar Harbor, lots of lakes and a large fjard (not a misspelling), a lighthouse, and probably some other interesting things to see and do. Indeed there are. 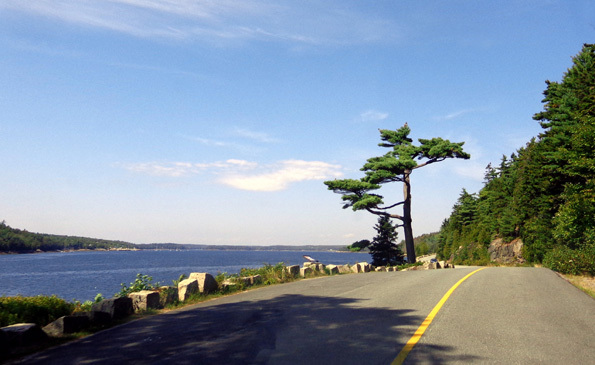 In this entry I'm including a variety of photos I took on two driving tours of the island. 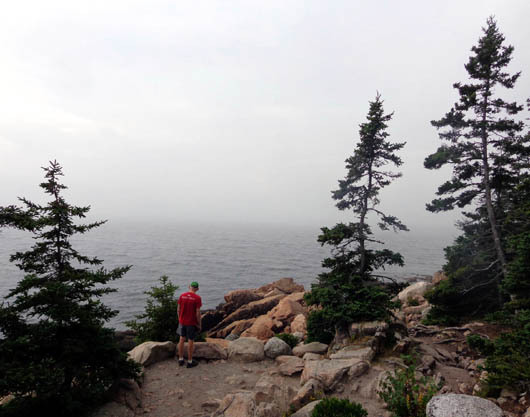 The first time was after a morning of hiking on Cadillac Mountain in the national park; I took the long way home and explored part of the eastern side of the island. I enjoyed it so much that I wanted to show it to Jim the next day. 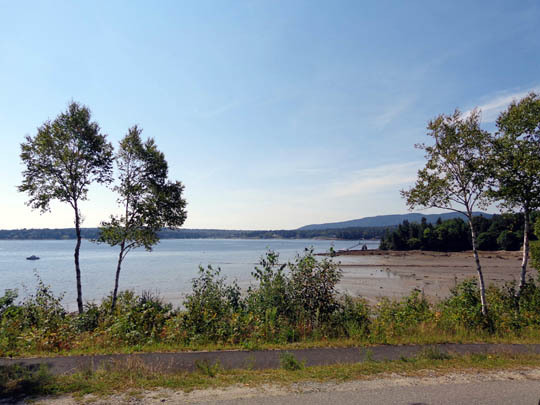 He saw how little traffic there is once you get away from Bar Harbor or the park and decided to include some of the little rural roads in one of his long bike rides. 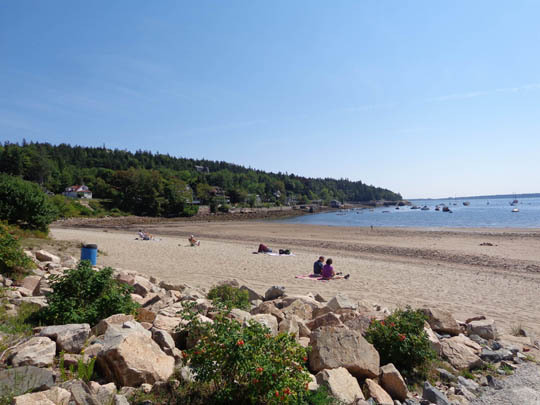 Long story short, we loved Mount Desert Island, particularly the park, the quiet and scenic rural areas, and the little coastal towns other than Bar Harbor. 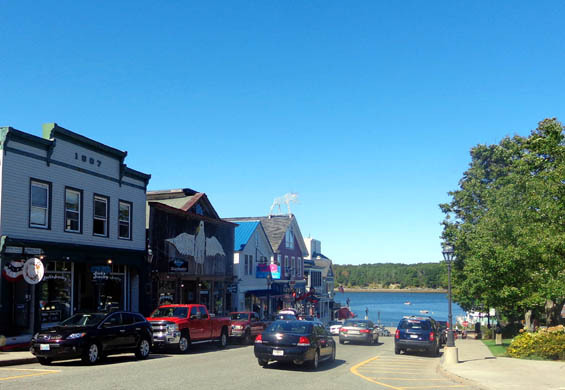 That town is too crowded and too much of a tourist trap for us but we can certainly see why the island is so popular with tourists and the people who can afford to own houses there. 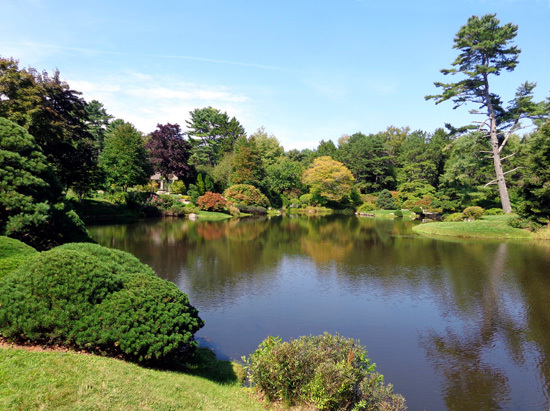 I took photos of an azalea garden with a beautifully landscaped pond on the way into Northeast Harbor . 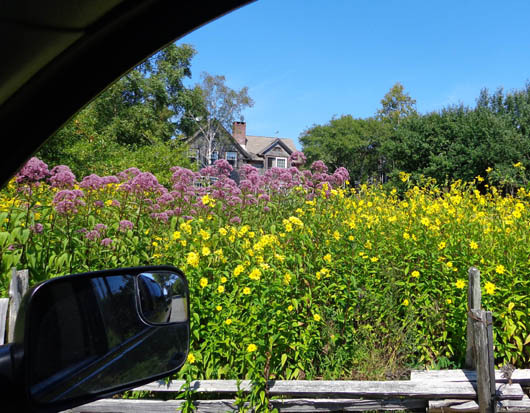 . .
No place to park in front of this house, so I took a picture from inside the truck. 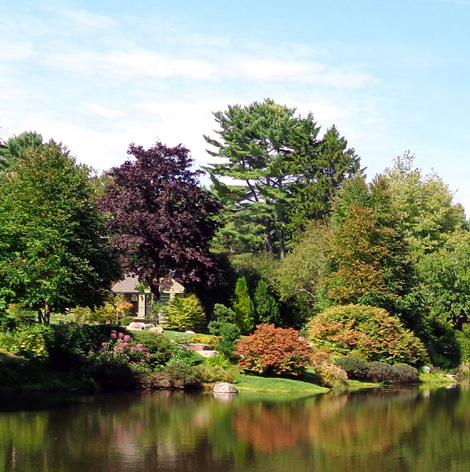 There are a lot of very nicely landscaped yards on Mount Desert Island. The next day I took Jim with me on a drive around the island so I could show him some of the interesting things I'd seen. 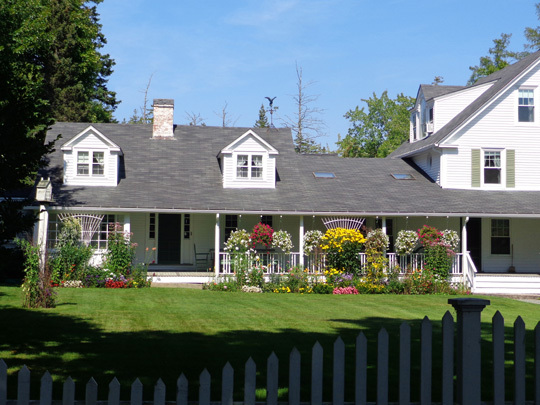 In the town of Pretty Marsh we saw a house with lots of beautiful impatiens in bloom across the length of the front yard. Later, when Jim did a long bike ride, he saw the owner of the house outside, tending the flowers. Jim stopped to talk with him for several minutes. The man was pleased to hear how much we enjoyed his yard. 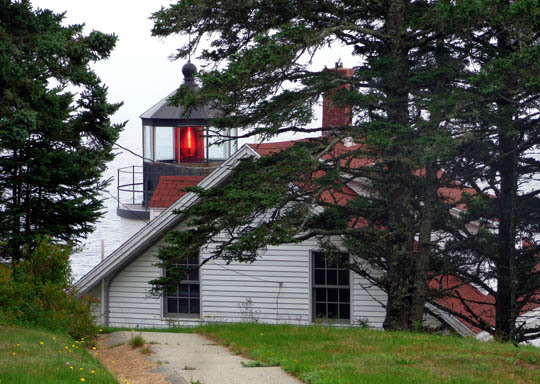 On my solo drive through the middle of the island I followed Sergeant Drive north of the town of Northeast Harbor. 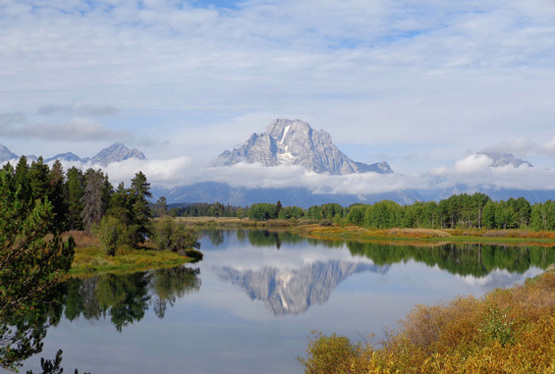 When I took Jim there the next day the sky was overcast but he could still see how beautiful it is. Maps and signs warn drivers that this road is for passenger vehicles only because it becomes quite narrow. As you can see in the next picture, there isn't anywhere to go if one vehicle is too big. Don't drive an RV here. Between a rock wall and . . . more rocks! 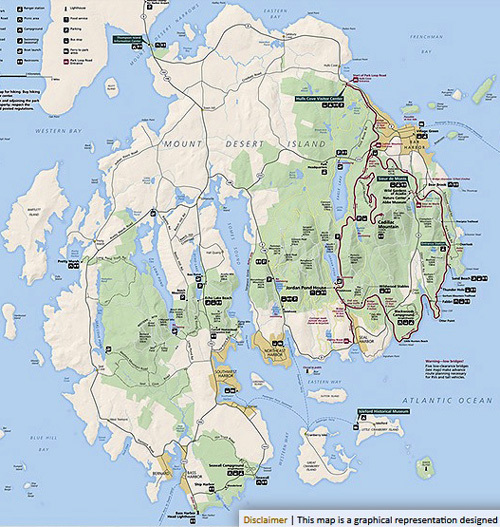 When Jim and I were exploring the island together we also drove a loop through the western half of Mount Desert Island. 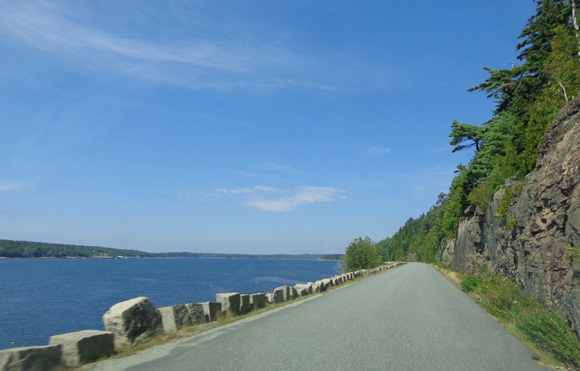 We drove around the northern end of Somes Sound and followed ME 102 past Echo Lake through another part of Acadia NP. 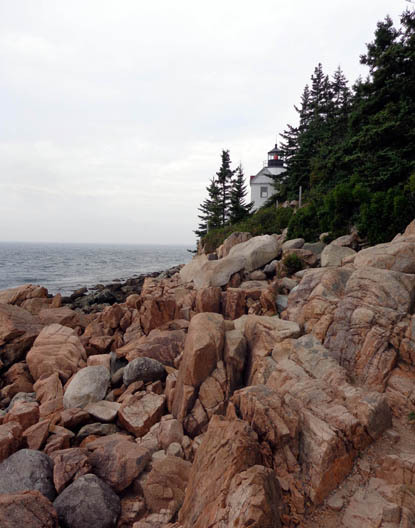 Below the town of Southwest Harbor we took a scenic loop past the Seawall Campground (also part of the park) and over to the Bass Harbor Head Lighthouse. 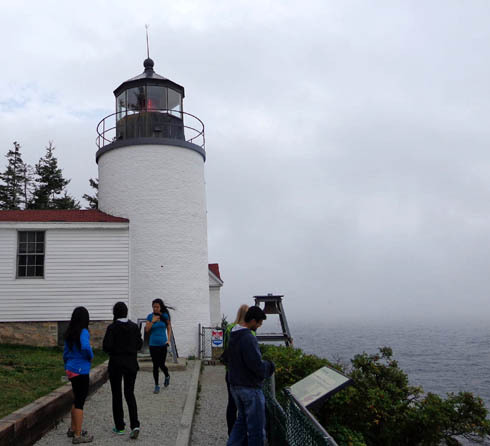 We did some hiking at this interesting lighthouse, which is also on national park property. You can follow paths in two directions from the parking lot. 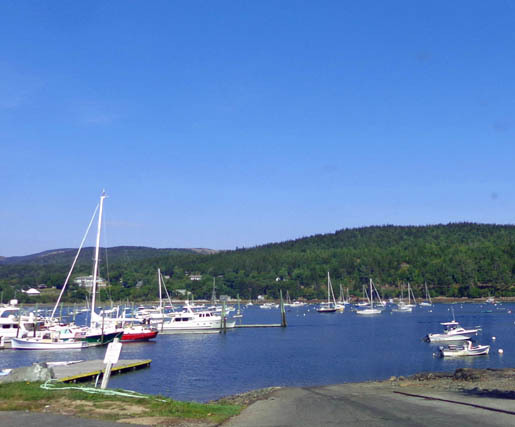 After leaving the lighthouse we continued our CCW loop around the far western side of the island through non-park land past Seal Cove, Seal Cove Pond, the town of Pretty Marsh, and back to our campground on the north end of the island. 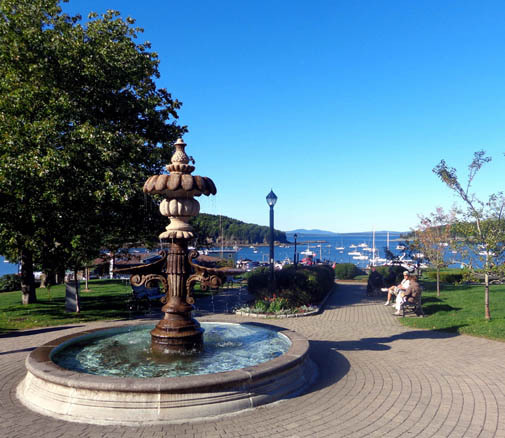 Just about everyone has heard of Bar Harbor, pronounced without the r's by many New England natives. 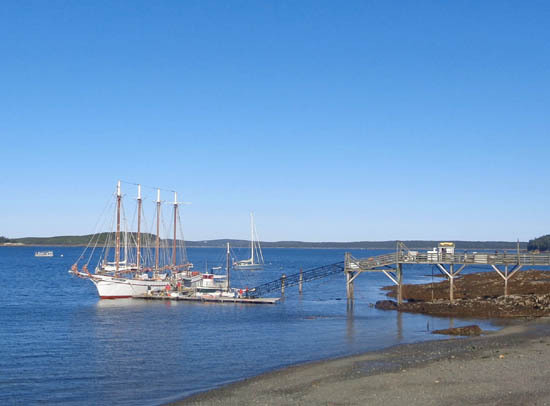 It has some beautiful houses, lots of unique shops and restaurants, and a beautiful harbor. It's also very crowded, even in September. Good luck finding a place to park near any of the destinations visitors are interested in. That's the main reason we spent very little time there. 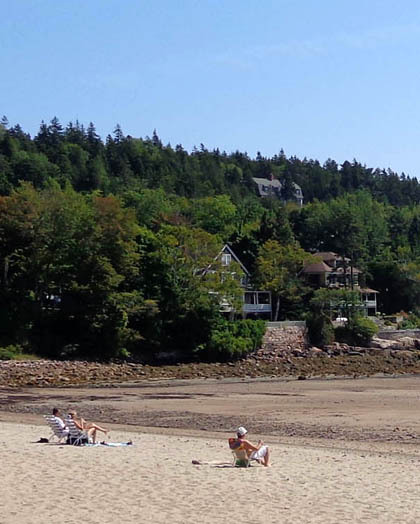 We did, however, enjoy the views from the water and walking out on the sand bar to Bar Island at low tide. If you look squint you can see a large metal wire moose on the roof of one of the shops. 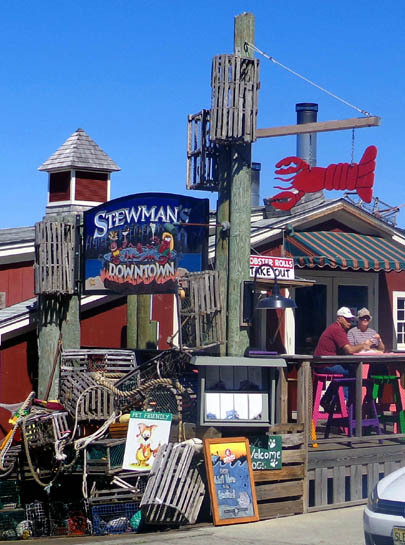 I liked the outside decor here with the lobster traps, ropes, etc. 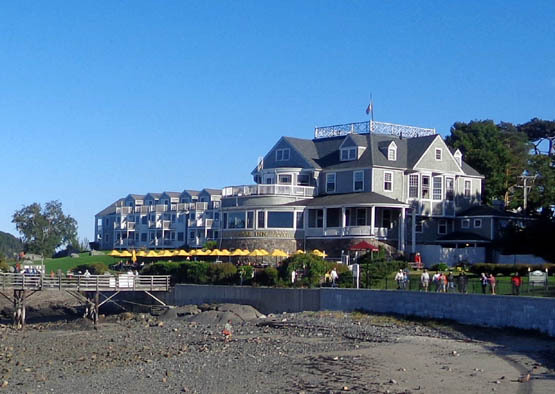 Bar Harbor Inn at low tide; water is up to the wall when the tide is high. 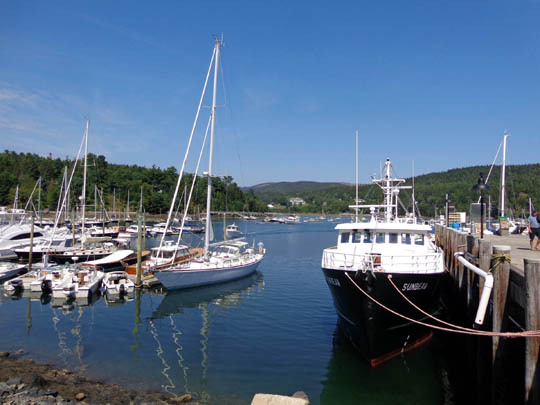 in front of the inn; I'll have another entry re: our cruise on the boat. 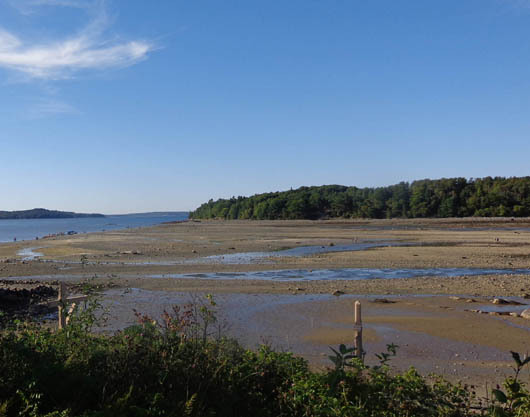 There are several small islands in the water to the north and east of Bar Harbor. Above and below: a couple hours earlier, this was covered with water. 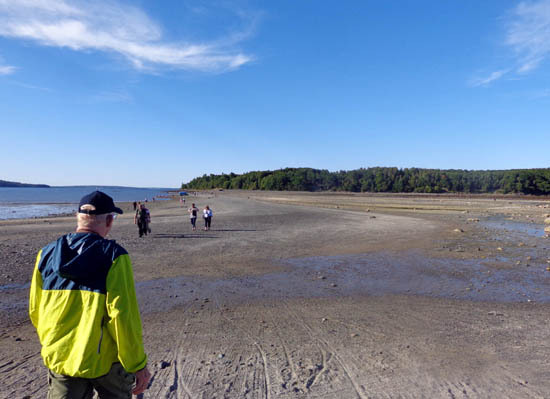 We didn't take the time this trip to walk all the way over to Bar Island to hike its paths. Maybe next time . 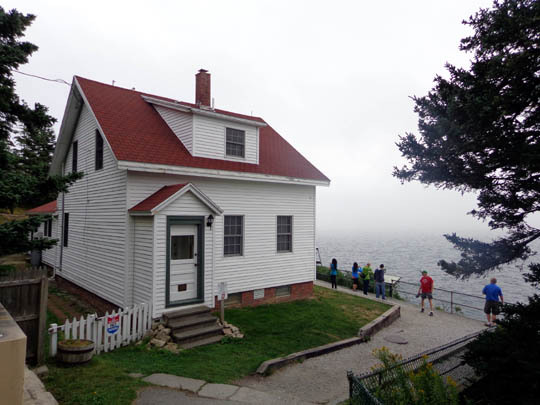 . .
Just about everyone can find something of interest to see and do on Mount Desert Island in addition to the obvious tourist stops of Bar Harbor and Acadia National Park. 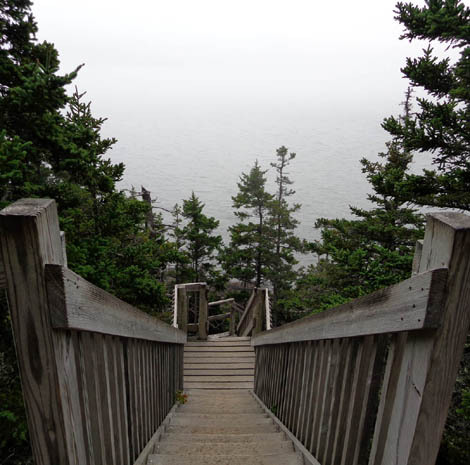 I encourage other visitors to take some time to explore the whole island. 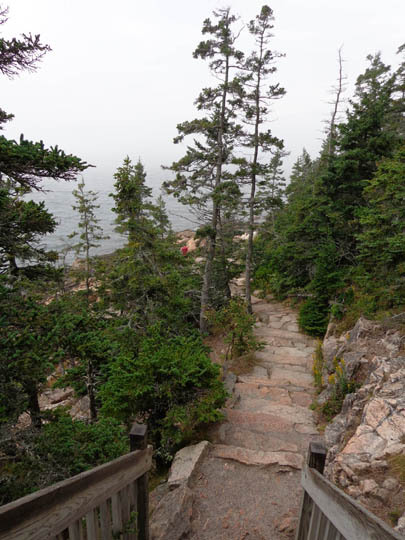 Our main goal during our visit was to explore the national park, however, so most of the remaining entries and photos of this area will be from Acadia.